Tobacco refers to an agricultural product derived from the leaves of a plant named N. Tebacum, which belongs to the family of Solanacaea. It has gained traction all around the world due to one of its extremely addictive element called nicotine which constitutes about 3% of tobacco’s total dry weight. Tobacco grows in warm climates and is currently grown in over 125 countries. Worth billions of dollars, the global tobacco industry represents a substantial contributor to the world economy. Over the past several years, the global tobacco market has witnessed many changes both in terms of production and consumption patterns. During 2009-2010, the tobacco production declined as a result of a fall in cultivation in major tobacco producing countries such as India, China and Brazil. However, the production increased soon in the beginning of 2011, particularly in the developing nations. This can be accredited to growing population, rising disposable incomes, lenient government regulations, surrogated promotion by transnational companies and increasing number of tobacco consumers. According to a new report by Expert Market Research, the market reached a volume of 8.7 Million Tons in 2018 and is further expected to reach 10.6 Million Tons by 2024. The different types of tobacco products available are Cigarettes, Roll Your Own, Cigars, Cigarillos and others. In 2018, Cigarettes dominated the market with the majority of the market share. Region-wise, China represented the biggest producer of tobacco with more than one-third of the global production. This can be attributed subsidies, loans, inputs, technical or other support from governments that farmers in China receive to cultivate tobacco. China was followed by Brazil, the United States and India. 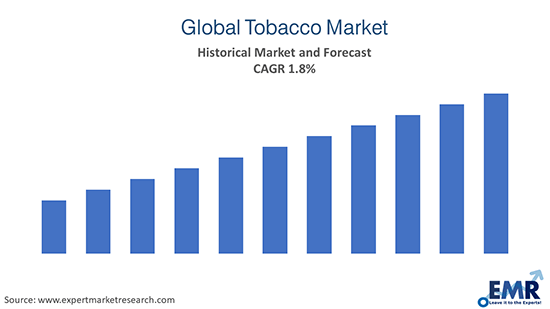 Some of the top players operating in the global tobacco market include China National Tobacco Corporation, Phillip Morris International, British America Tobacco, Japan Tobacco International, Imperial Tobacco Group, India Tobacco Company Limited, Gudang Garam, Lorillard, Reynolds American and KT&G.